The people of the goddess Danu, or Tuatha de Danann, traveled from for cities: Murias, Findias (sometimes written Finias), Gorias, and Falias. Remember, from last time, that Dagda brought the magical cauldron from Murias. We will talk about the magical gifts from Gorias and Falias soon, but the gift from Finias is really interesting. Nuadu brought a sword. Nuadu was also known as Silver Hand and was the first King of the Tuatha de Danann, and was so for seven years before they came to Ireland. They fought the existing inhabitants of Ireland, The Fir Bolg, and during the first battle, Nuadu lost his hand, costing him his kingship. Among the Tuatha de Danann, one could not be king if he was physically blemished. He was gifted a silver hand, some say by the gods and others say by a physician, but he was able to reclaim his kingship. The Sword of Nuadu symbolizes courage and fearlessness in battle. It was said to no one could escape once it was drawn from its sheath, and none could resist it. 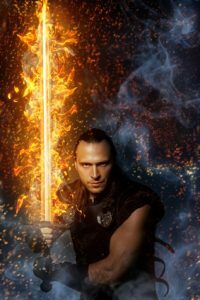 The sword is also described in the Tain legend as ‘Nuadu’s Cainnel’ – a glowing bright torch.. It has also been likened to Excalibur. If you want to read more, check out Alliisaac Storyteller’s blog.